Seattle Seahawks linebacker Shaquem Griffin is an inspiration to many and proof that whatever life throws at you, you can catch it make your dreams reality. The 23-year-old made history by becoming the first one-handed player to ever play in the NFL, but, even more inspiring, is the work he does off the field to show people struggling with similar disabilities that anything is possible. 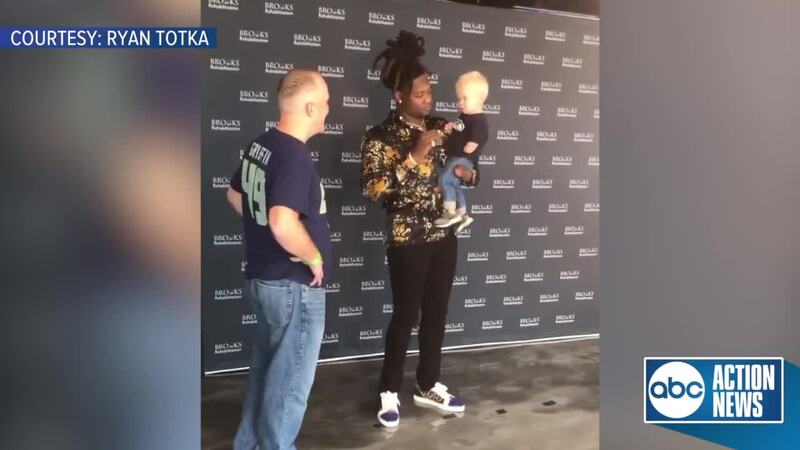 JACKSONVILLE, Fla. — Seattle Seahawks linebacker Shaquem Griffin is an inspiration to many and proof that whatever life throws at you, you can catch it make your dreams reality. The 23-year-old made history by becoming the first one-handed player to ever play in the NFL, but, even more inspiring, is the work he does off the field to show people struggling with similar disabilities that anything is possible. The former University of Central Florida Knight held a meet-and-greet with fans on Saturday in Jacksonville with Brooks Rehabilitation, an organization that helps children with disabilities. During the meet-and-greet, Griffin met the most adorable Seahawks fan and the moment is going viral on social media. Ryan Totka shared the video on Twitter with the caption "All.The.Feels 🤗 I’m Not Crying, You’re Crying. A special moment with @ShaquemGriffin and ⁦@Eric_Harding 🙏🏻⁩ ⁦@UCF_Football⁩ ⁦@UCFAlumni @Seahawks #AgainstAllOdds"
Joseph, the pint-sized Seahawks fan, is also missing his hand and Shaquem was so excited to meet him. He posed for a few photos together with the toddler and Joseph's whole family joined in on the meet-and-greet to get a group photo. It was definitely an unforgettable moment for everyone involved. Griffin continues to be one of the most inspiring stories in the league and there's no doubt that he'll continue making an impact on young lives by showing them that they can tackle any obstacle in their way and come out on top. Kelly Bazzle is the Digital Executive Producer at ABC Action News in Tampa. Follow Kelly on Twitter.